From Booktopia: On an overcast, wind swept day in January 1965, two teenage girls were raped and murdered on an isolated beach in Sydney's southern suburbs. The discovery of their bodies the following day sparked a public outcry, media frenzy and one of the largest police investigations in Australian history. 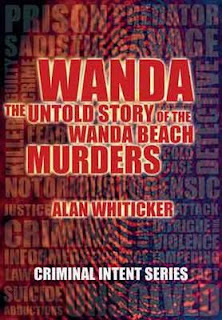 To this date the deaths of Christine Sharrock and Marianne Schmidt - notoriously know as the Wanda Beach Murders - remain unsolved and the story behind the crime has never been told. In this book Alan Whiticker re-creates the lead-up to the aftermath of the murders and provides a fascinating insight into the history, lives and fate of Christine and Marianne. Thoughts: I use to be almost fanatical about books to do with murders - especially mass murderers, serial killers and unsolved murders. However, after awhile it became hard to find anything new, different. Anything that wasn't simply a rehash of stuff I'd read before. When this came through the returns chute a work it looked interesting enough for me to pick it up. It is one of those events carved into the psyche of many Australians. Two girls who were brutally murdered with no real trace of who committed the crime. The thing that most probably stood out for me in this is how far our law enforcement services have come in the processes they use. Everything they do now is so more precise and the equipment they have available a lot more accurate. The book contains no explosive insights. What it does do is analyse the crime investigation and the media coverage of the murders. It looks at possible links to other murders and the suspects who came under the microscope. Wanda is well written and keeps you turning the pages. As I said, nothing explosive, but well worth the read if true crime is a topic you are interested in.